November | 2014 | Does This Font Make Me Look Fat? Laura has been really busy at work so we haven’t done much collaborative writing for a couple of weeks. 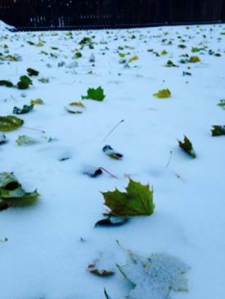 I’m taking advantage to do some cleaning up…in my office and outside where we’re getting the yard ready for winter. Outside: I manage to convince myself that outside clean-up is more pressing than the inside. It will soon be too cold to work comfortably outside; however, I think the real reason is that the decisions about what office stuff to get rid is more difficult. That box of assorted computer cords and gizmos always goes back into the closet. What are those things for, anyway? And what if I need something in that box? It’s been nine years since we moved into this house and I haven’t needed anything yet, but you never know. This is the time of year when I put the bag on the lawn mower and switch over to bagging. That always involves turning the mower over on its side and cleaning out the underside with various sizes of screw drivers. I feel quite virtuous mulching the leaves and grass and putting it on the garden beds. Free fertilizer. And I like mowing better than raking leaves. We’ll have a hard freeze one of these nights, so it’s also time to bring inside the houseplants that have been living outdoors. There seem to be more every year and I’ll have to take a trip to the garden supply store for more saucers to put under the pots so water doesn’t damage my wood floors. 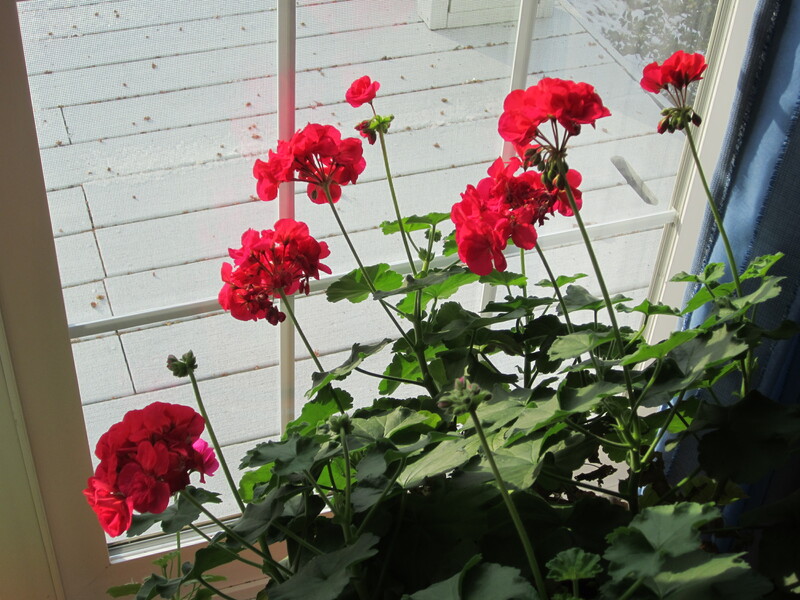 My geraniums always love being inside. They grow to three feet tall and are full of blooms. This window faces northeast and gets some morning sun. The photo is from last February. I extended my drip irrigation in one of my beds. That can only be done on a sunny, warm day because you have to fit plastic pieces together and that requires a little give. The first time my husband and I tried to put some drip irrigation together was on a March day. We used a hair dryer to warm up the plastic and putting the pieces together was very difficult. Note to self: only install drip irrigation in warm weather. I have to order more tubing and parts and will finish that project next spring. The drip irrigation saved me so much time this year. We put it in the window boxes at the front of the house and they’ve never looked so good. 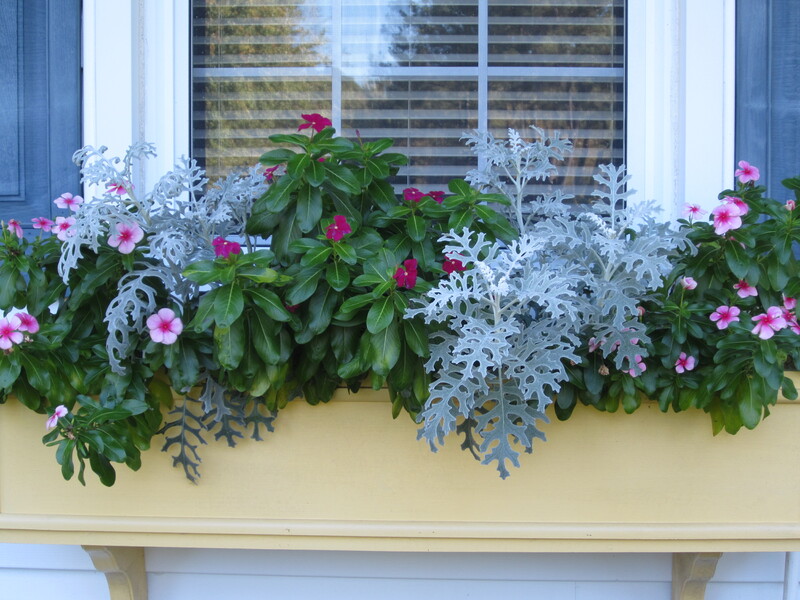 Before the drip system was installed, I was watering those window boxes twice a day by the end of August. The irrigation system is on a timer and once that’s turned on in the spring, I don’t have to think about it again. The Office: It’s hard to know what to keep and what to pitch, but I’ve long ago run out of storage so I need to try. I did make a dent in a 7′ bookcase the other day when I pitched old software. Some of it I knew I would never use. Some was so old the software downloaded from floppy disks. (I might have a floppy disk converter in that box of computer odds and ends.) I kept the PhotoShop 7 that I got when I took a class at Harford Community College years ago. It does the things I need to do and if I ever have to reload it on a new computer I’ll be ready. It’s the boxes of writing drafts that I really agonize over. The drafts are on various files and since most of the writing I’ve done in the past five years has been with Laura, we have these files on both our computers. How many versions of our novel Big Skye Ranch do we really need? In fact, do we need to save any paper versions? Sorting through things reminds me of projects started and abandoned. I found a copy of a romance novel that my husband and I worked on ten years ago. Could I pull that out and get it ready to publish? It was set in the 80’s, before internet, cell phones and iPads. I hardly remember that life. Would readers relate to that story now? I thought there might be a file of that novel on my old laptop, but I booted it up and couldn’t find one. Retyping 250 pages isn’t very appealing. And last week I had an email from someone who had just read my two Caribbean paranormal/ghost novels (A Dream Across Time and A Circle of Dreams) and wanted to know when the third was coming out. 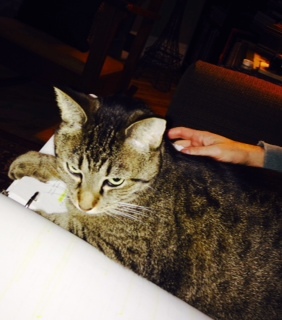 I had to tell her it was not at the top of the writing project list. I suppose clean-up time is a lot like reworking a piece of writing. What to keep and what to toss? Cold weather is expected this weekend so escaping into the garden is no longer going to be an appealing option. I’m going to have to make a decision what writing project to work on until Laura is able to free up some time.